Rose celebrates her 105th birthday! Home/Latest News/Rose celebrates her 105th birthday! 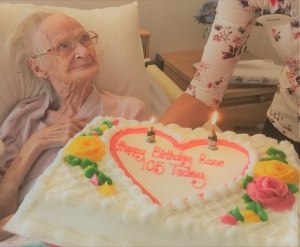 Rose Aldritt, who has been a resident at Robert Harvey House for nine years, celebrated her 105th birthday on Sunday 29th July, 2018. The special occasion was marked by staff, residents and her family who helped to share a wonderful cake and all admired her second telegram from the Queen! We would all like to wish Rose a very Happy Birthday!